As we enter the era of 'clean beauty', this was written in response to huge demand. Women today are increasingly conscious of ingredients in cosmetics: they want more natural beauty products both for their own health and for the health of the planet. There are, however, all sorts of natural beauties: some want the full whammy with certified organic products while others are happy with a combination of natural and synthetic ingredients. 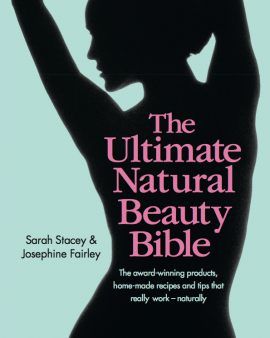 And that is fine by us: in fact, at the beginning of the book you will find a questionnaire (‘What Sort of Natural Beauty Are You?’) to help you find the products that will suit you, using our unique ‘daisy rating’. This assesses products and labels them one to three daisies, depending on their degree of naturalness. To coincide with the launch of The Perfume Society, which Jo has set up with Lorna McKay – more here – they also worked together on this fab and lavishly-illustrated book, which captures the romance and beauty of perfumery in an accessible, informative, accessible way. It brings together everything you need to know about perfume including guidance on which ‘scent family’ you’re attracted to (to help you find new perfume ‘loves’), the art of shopping for fragrance (and its after-care), the journey ‘from field to flacon’, and offers a run-down of the 100 Perfumes to Try Before You Die – which include many of the greatest scents ever bottled. If you’ve ever had a question about fragrance, it’s answered here…! Packed with insider info from the world’s leading experts and interviews with some of greatest international perfumers, this is an essential companion for anyone with a passion for fragrance – or who simply wants to learn more. And of course, it makes a foolproof and fabulous gift for a perfume-lover, to be referenced time and again. Victoria Health has copies of The Perfume Bible for £20 (recommended price £25) – or for VIP Subscribers to The Perfume Society, the price is just £16.25 (including free P&P) at perfumesociety.org.